Welcome to Feeder Business! The best product to keep track of new information in teams. 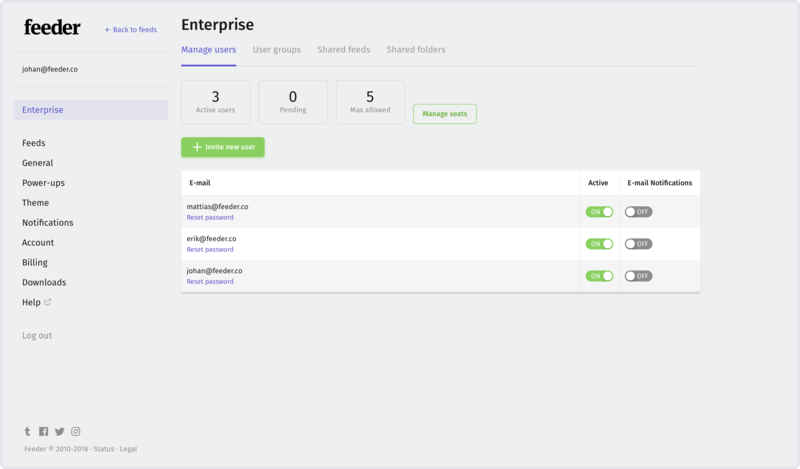 Shared feeds and folders, user groups, common notifications and more. The first step is to invite users to your account. Colleagues, team mates or project members. Anyone that you want to start sharing feeds with. Under Settings click the Enterprise tab in the sidebar. 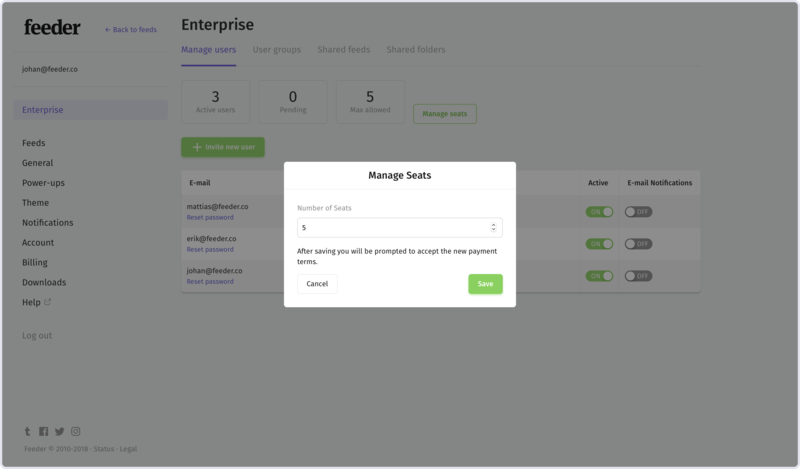 Here you can see an overview of your Feeder Business account, you can invite and manage users, as well as increase or decrease the number of seats. Begin by clicking the green Invite users button, and fill in the emails of your colleagues. They will receive a link in their email where they will be able to sign up to Feeder. If they already have joined Feeder with that email, they won’t have to do anything. They will automatically be added to your Feeder Business account. Under the tab User groups you also have the option of creating user groups. If you have different departments, projects or teams, this is a great way to manage what feeds these groups should follow. 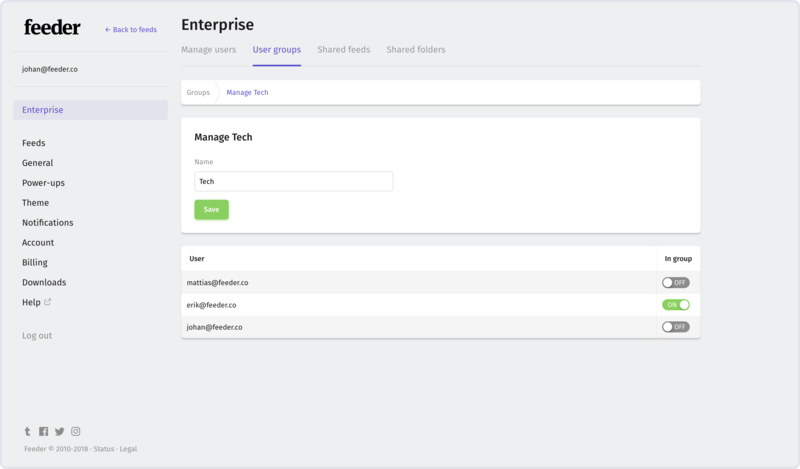 The next step is to create shared feeds and folders. If you already have many feeds in your account today, the best way to share them is via Shared Folders. Click the Shared Folders tab under the Enterprise section and click Add folder. This will create at first an empty folder that will be shared to all users in your account. To fill that folder with feeds, click the Feeds tab in the sidebar. Drag and drop feeds into that folder. They are now shared feeds inside that folder. If you have no feeds: begin by adding feeds under the Feeds tab in Settings. Click the Add feed button and follow the steps to add feeds. Now you have feeds, but they are not shared with your team yet. Either follow the above steps of creating a shared folder, or by visiting Enterprise > Shared feeds and then clicking Add feed. From there you can select one of your newly added feeds and by doing so you have now converted it to a shared feed. 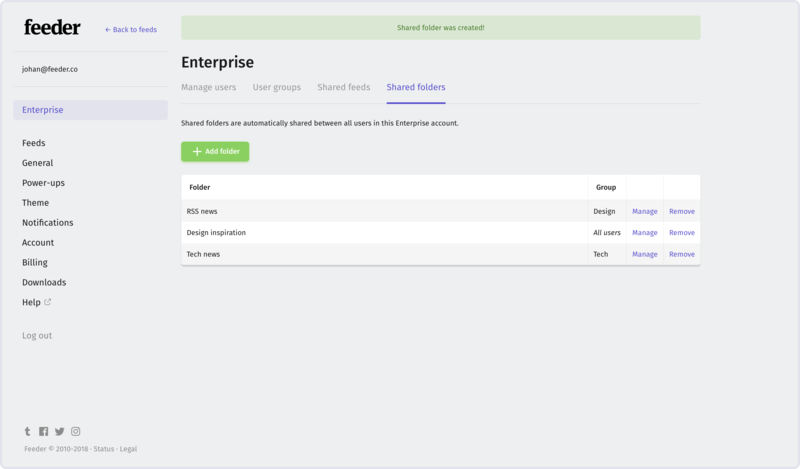 Please note: Shared feeds cannot currently be added to User Groups, that is why we recommend adding using Shared Folders instead. Under Shared folders you see a list of the shared folders you have created. To limit specific folders to certain user groups click Manage on that folder and in the drop down Group you can choose which user group that folder will belong to. Please note: Currently the administrator of the Feeder Business account needs to make sure they are included in all user groups to be able to add or remove feeds from them. The number of seats is how many users you can have in your Feeder Business account. To add seats: In settings visit the Enterprise tab the sidebar and click Manage seats. Here you can increase or decrease the number of seats. 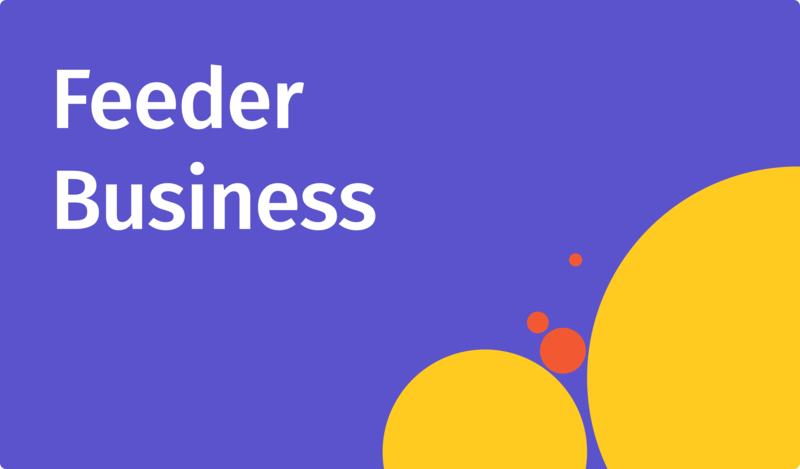 Currently all users get access to all features under Feeder Business. We are working on creating User Privileges where some users will be administrators that can increase/decrease seats or manage shared feeds and folders. Something missing or not working? Please contact us at support@feeder.co. We highly value Feeder Business users and offer hands on setup of your account as well as priority support. If you are missing important features let us know. We work tightly with users to solve specific needs.